View our current selection of Diamond Rings. Rose gold is one of the hottest trends. Combine that with fashionable diamond rings in a butterfly motif for one of the most memorable and unique diamond rings of the year. 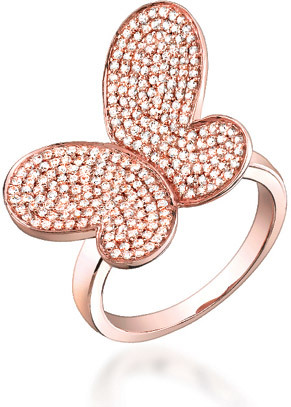 Our butterfly diamond ring is set in 14k rose gold with 0.80 carats of high quality G-H Color, SI2 Clarity diamonds. Butterfly measures approx. 1" x 1". Shank measures approx. 2.75mm wide. We guarantee our 0.80 Carat Diamond Butterfly Ring in 14K Rose Gold to be high quality, authentic jewelry, as described above. Over 5,000 Jewelry Items Online!